Register Now to Get Early Bird Pricing for Sage Summit! The largest gathering of the year for Sage customers and business partners, the Sage Summit annual conference offers one-of-a-kind learning sessions, networking opportunities, expert guidance, and tips that will help you master your Sage 300 software. What products will be covered? Sage 300, Sage CRM, Sage Live, Sage HRMS, Sage Intelligence, Sage Fixed Assets, and more, as well as relevant business topics geared towards growing your business. It’s a great environment to learn more about the products you are currently using along with available products you could leverage to become more effective and productive. Can I get CPE or CEU credit? Sage Summit attendees can earn up to 18 hours of continuing professional education (CPE) and continuing education unit (CEU) credits. No course information may be obtained from NASBA. When and Where is Sage Summit? 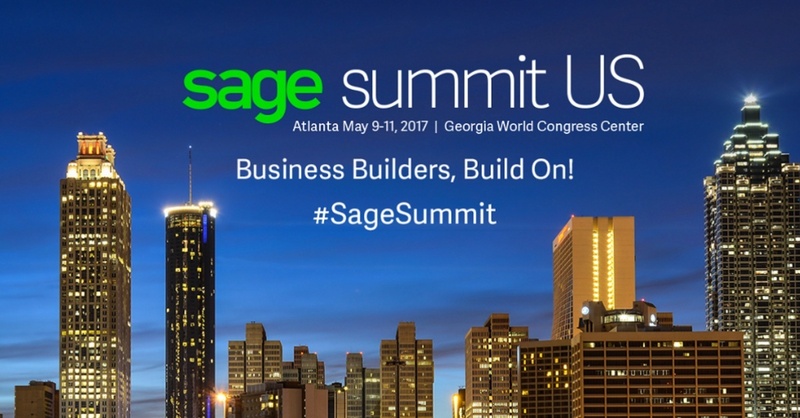 Sage Summit 2017 will be held May 10-11, 2017, at the Georgia World Congress Center in Atlanta, Georgia. Should I attend Sage Summit? Yes! It is one of the most valuable gatherings for small and midsized businesses. Learn how to steer your business toward a brighter tomorrow at Sage Summit US—the must-attend event for thought leadership, inspiration, and innovation for businesses like yours. What is the focus of this year’s Sage Summit? For businesses of all sizes, whether established for 20 minutes or 20 years, this is a must attend event for thought leadership, inspiration, and learning. Get up-close and personal with solutions and services designed to support your business growth. Get product training, advice, and inspiration from the best and the brightest experts in their field. Connect and get inspired from business and thought leaders, entrepreneurs, experts, and peers. Sage inspires the success of businesses and their communities around the world through the use of intelligent technology and the imagination of their people. The keynote speakers are the most accomplished leaders within Sage. Register by April 14th to get the early bird pricing of $199!